This is the second battalion of IR56 Daun, in the WAS, and 'Mercy' during the SYW. The facings are violet and this is a tricky colour to work with as you need to mix pink with it to give it a highlight not white. 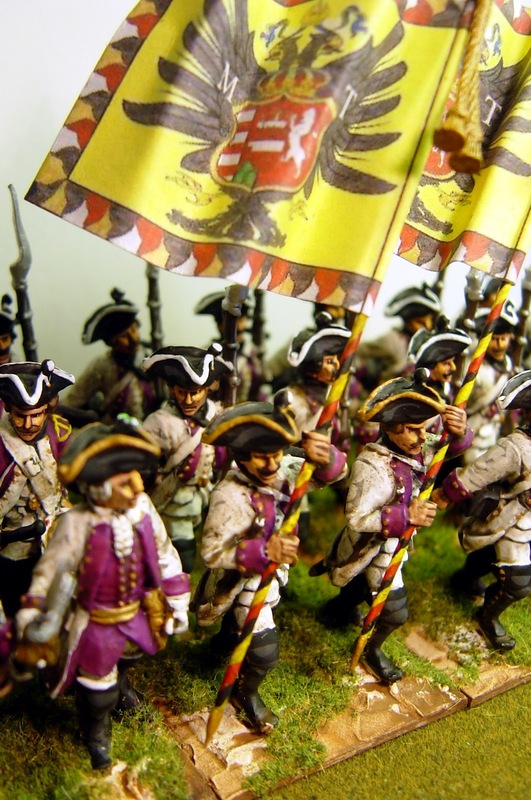 There appears to be no unanimity as to whether violet was a facing colour used by the Austrians in this period. 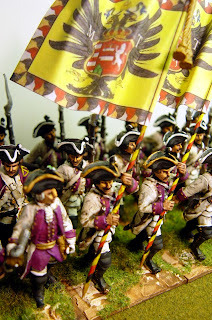 Greenwood & Ball list three regiments with violet facings – IR16 Konigsegg, IR 42 Gaisbruck and IR 56. Duffy says that 16 and 56 had “blue or violet facings” but that 42 had blue. Kronoskaf, on the other hand, says that 16 had blue facings, but that 42 had violet although it then muddies the water by calling it “violet blue”. It says that 56 had blue facings but adds that “ the blue distinctive colour is represented differently by every author.” This just shows how difficult it is to pin the colour down. Anyway, I'm happy with violet! This anecdote about this regiment's musicians is given in Duffy:”....the woodwind of the regiment of Daun became so popular in Vienna that when the troops marched off to war in 1756 the citizens petitioned for the Hautboisten-Banda to stay behind.” This may well have been a visual thing as well as a musical one – the band would probably still have been dressed in violet coats,faced in white, so would have looked quite spectacular. 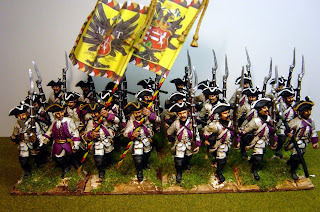 Phase one of this 40mm project is to do 10-10-6 by which I mean 10 battalions of infantry, 10 squadrons of cavalry and 6 guns – for both Austria and Prussia. For the Austrians, I have now finished 7 battalions, 5 squadrons and the guns are on their way here in the post. 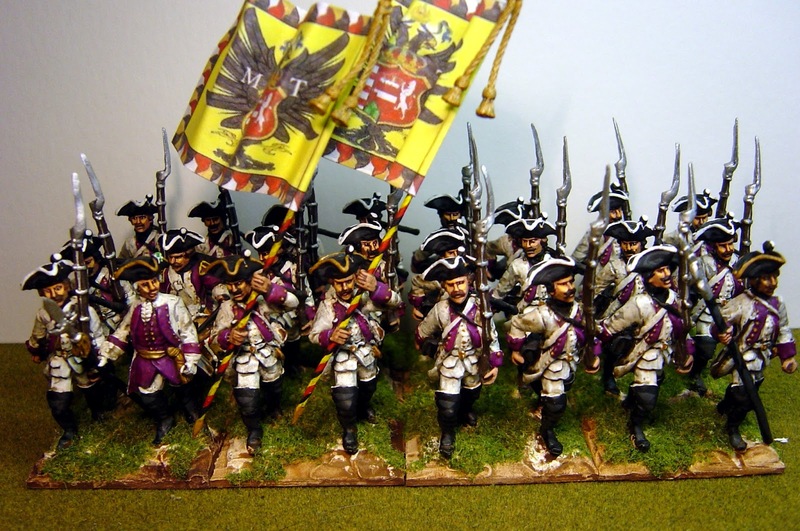 Cavalry will have to await hussars from Chris at Sash & Saber before they get reinforced. But I am making progress.